providing a rare glimpse into the art of spiritual expression,"
the site says. Below is the full article. identity, ordered the creation of the first khachkar. a lesson in iconology is needed. soteriological victory: an emblem of triumph over the mortal vale. residences, roadsides, and eventually, everywhere. and the infinite, amidst an unpredictable future. artist and the patron, the country, the church, and ultimately, God. art form a true Armenian cornerstone. Two brothers set about chiseling slabs of milky gray limestone, each using a hammer bluntly pounding the end of a long, thin, and sharp instrument. Stone dust falls away, revealing delicate channels underneath. They work silently, only stopping to light a cigarette, as their carvings form intricate symbols representing the tree of life, eternity, vines and other traditional patterns. All of their carvings are on limestone, the same material from the same local quarry in Khachik village used to build the fabled Noravank monastery—another popular motif. Just over sixty miles from the Armenian capital of Yerevan, Noravank (literally, “new monastery”) has inspired stone carvers and artisans for centuries from its hilltop perch. The early Armenian architect Momik designed this site in the thirteenth century, and since then, artisans have carved almost every surface to honor bishops, princes and the Christian faith. 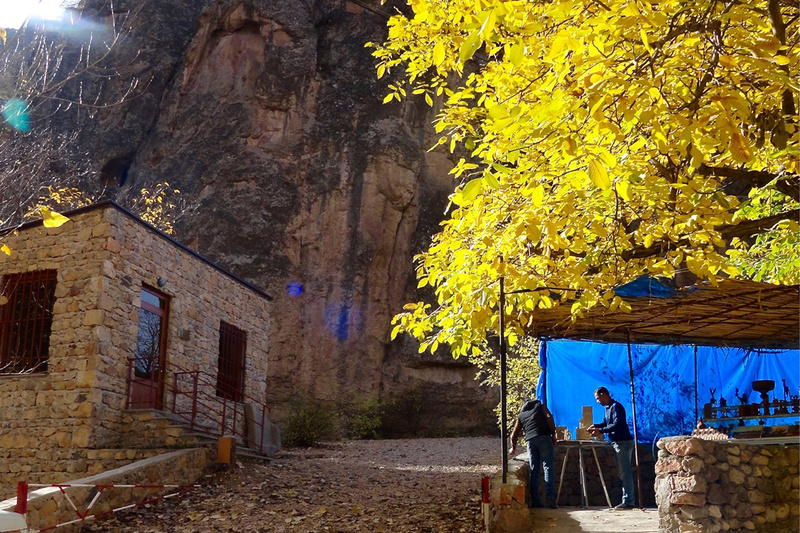 Where the road leading to the monastery meets the main highway, there is the entrance of another tourist draw: the Areni-1 cave, one of the world’s earliest known wine production facilities. Outside this entrance, the Ghazaryan brothers work. Here, they mindfully carve and teach others to do likewise. This is their life’s work; they create work year-round in preparation for the main tourist season of March through November. This is where their work is made and the only place it is sold. Growing up in nearby Yeghegnadzor, Ruben and Karen’s father enjoyed carving stone as a hobby. Only in the last seven years have the brothers dedicated themselves to mastering the craft at the suggestion of a local priest. 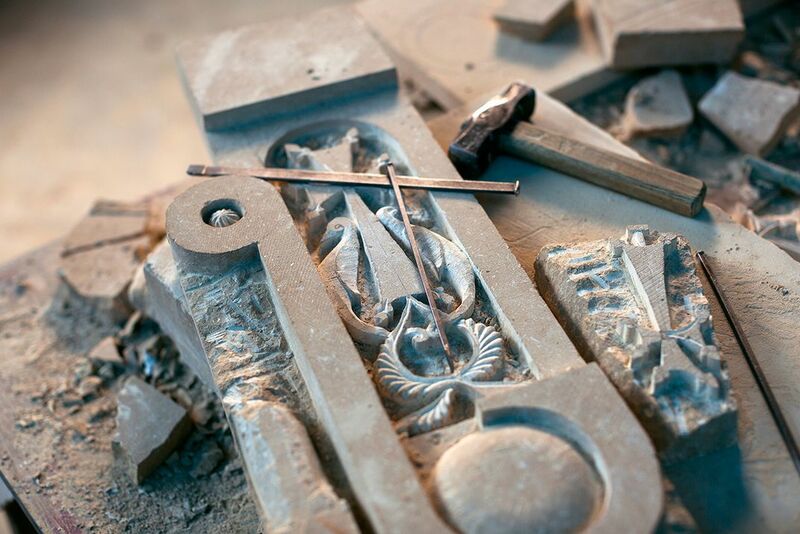 Their tools consist of the same hammer and chisel used when Armenian stone carving began; however, they learned by the modern method of studying online videos. Like all master artisans, they have refined their skills through constant practice. “We work mostly together, concentrating on the form and what it will become, always inspired by Noravank like Momik,” Ruben explains. “To teach others, maybe even our children, here someday,” Karen muses. It was a clear and quiet autumn morning when we visited Ruben and Karen during our fieldwork visit for this summer’s Folklife Festival Marketplace. All of the colors of the season—auburns, vibrant yellows, and russet gold—were interrupted only by the blue tarp covering their roadside stall drawing quiet attention to their work. We left them there, in the blue sheen of their tarp, as they continued the idea of paying tribute to their own stories and inspirations, the buildings, landscape and events that surround them, with hammer, chisel, and local limestone. 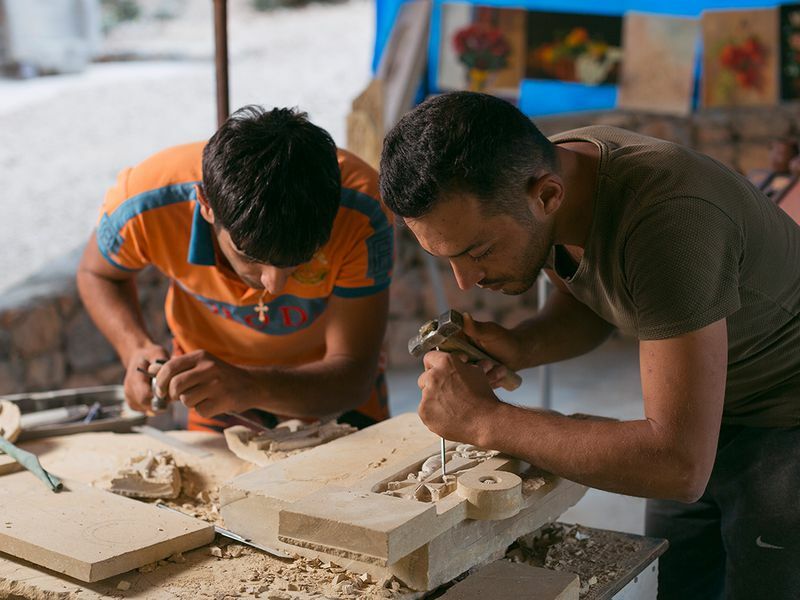 Visit the 2018 Smithsonian Folklife Festival June 27 to July 8 to meet Ruben and Karen Ghazaryan and learn more about their stone carving. Their work will be for sale—for the first time outside of their stall—in theFestival Marketplace located in front of the National Museum of American History during the Festival. Khachkars (cross stones) dating back to the 11-13th centuries has been discovered in Drmbon community of Martakert, Artsakh. 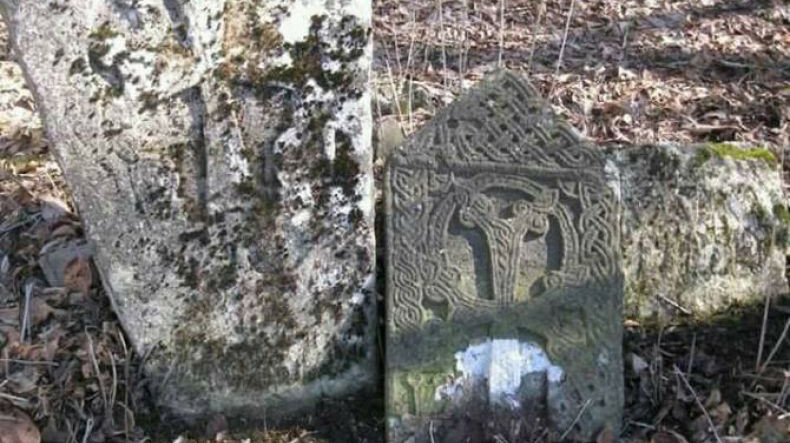 The cross stones were found near the chapel and cemetery of Drmbon by the head of Martakert Regional Service, Avetik Aghabekyan, Artsakhpress reported.